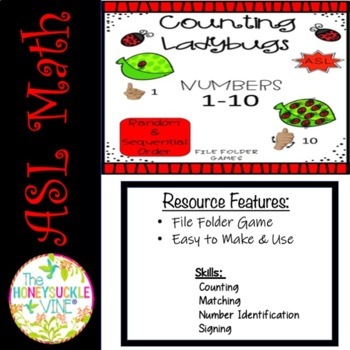 ASL Counting Ladybugs Match-Up File Folder Games- Random and Sequential order These file folder games are a resource for Deaf and Hard of Hearing and other students who can benefit from sign language. 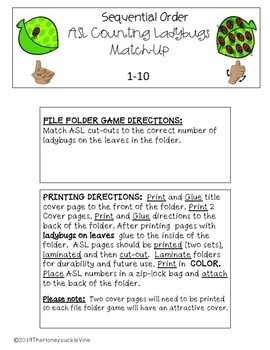 ASL Counting Ladybugs Match-Up File Folder Games with instructions for additional activities which are for a card game and a game to use ladybug cut-outs for counting using 1:1 correspondence. 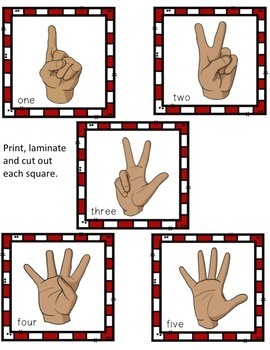 The object of the game is of students to count ladybugs on a leaf and match with the correct corresponding ASL numeral card to that leaf. The ladybugs on leaves in random order are more challenging, whereas the ladybugs on leaves in sequential order are easier for some students. 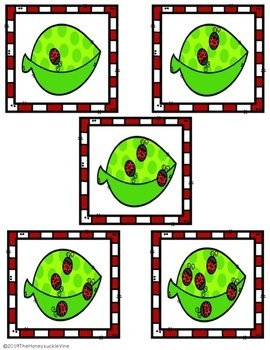 This product includes a cover page for file folder games which will need to be duplicated, 4 ladybug pages (2 pages with ladybugs in sequential order and 2 pages with ladybugs in random order), 20 ASL cards, game directions, printing instructions, and additional activities.